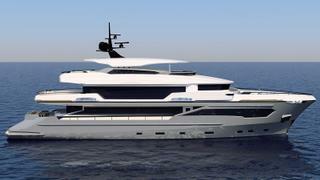 Turkish yard AvA Yachts has unveiled renderings of its latest yachts in the Kando series, ranging from 27 metres to 40 metres. 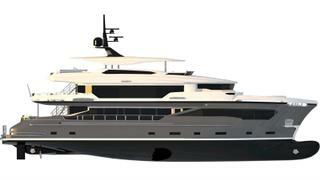 Currently in-build and due to launch in summer 2018 is the 34 metre Kando 110. The aluminium over steel tri-deck displacement yacht boasts five guest cabins, with the master suite enjoying 27 square metres of private space. 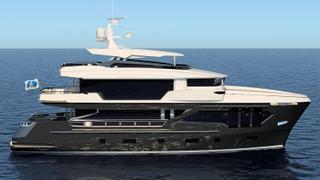 Kando 110 has been designed in-house by naval architect Atilla Kucukdiker, and the modern interior features accents of American walnut, wenge and stainless steel. Tipped to reach a top speed of 14 knots, the yacht will make her debut at Cannes in September after being delivered to her Norwegian owner. Completing the series is the smaller Kando 90, and the larger 36.5 metre Kando 120 and Kando 130, all of which have already received significant interest from potential owners, according to the yard. The Kando series has been developed by the Antalya-based yard to spend extended periods at sea, and places an emphasis on large internal volumes. 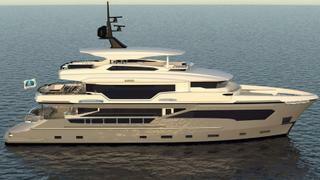 “AvA Yachts wanted to develop the Kando range because it saw that size range as being somewhat under-represented with contemporary-styled, full displacement, steel-hulled, large volume, long-range cruising yachts. AvA Yachts is able to offer a superlative quality product in a fast delivery timeframe at prices which are massively more attractive than anything comparable from Italy or Holland,” says the yard. Characterised by a modern look, the yachts all share floor to ceiling windows and strong, masculine lines. All the yachts are built with steel hulls and aluminium superstructures, with a bulbous bow for efficiency savings. The yard also produces much of the fit out in-house, including the stainless steel fittings and the interior cabinetry. The yard will be announcing a production and office expansion programme over the summer to cater for the interest in the Kando series.